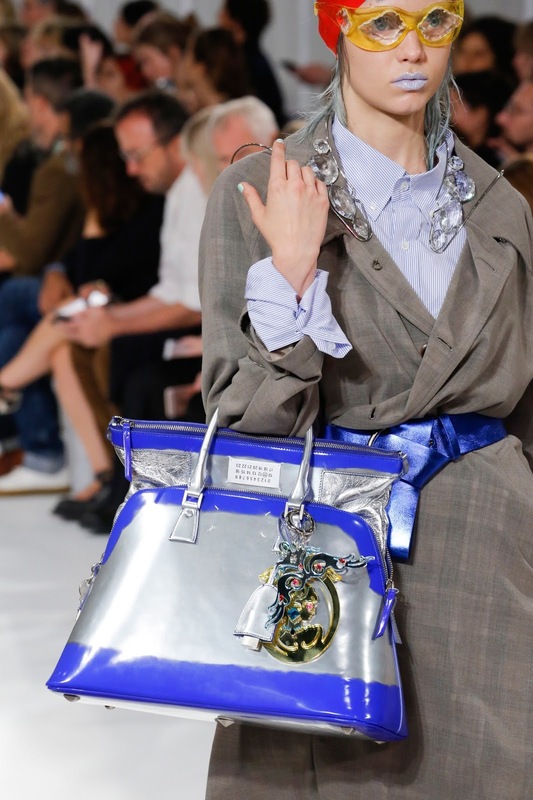 We have been hunting for the perfect bag for months and think we've found it at Maison Margiela. Bermuda provides inspiration in the most unusual ways. This time, the triangular legs of the Bermuda table and desk by Thomas Eriksson for Asplund are perfectly situated to make seating a large number of people around it easy. The table is made of polyurethane lacquer with a laminate top and lacquered metal legs. The Bermuda table comes in white or grey. Portable speakers have become pretty ubiquitous since we started writing about them back in 2012, but we thought these high-end loudspeakers from Danish Audiophile Loudspeaker Industries ("DALI") were worth a closer look as we loved the stylish design of the Katch Portable Speaker. The body is made from extruded aluminium, and holds a 2 x 18W Class-D amplifier powering a pair 21mm soft-dome tweeters and dual 3.5-inch aluminium woofer. The speaker connects over Bluetooth 4.0, has Apt-X support for cleaner audio, runs for up to 24 hours per charge. Adding a natural touch is the built-in sliding leather strap. 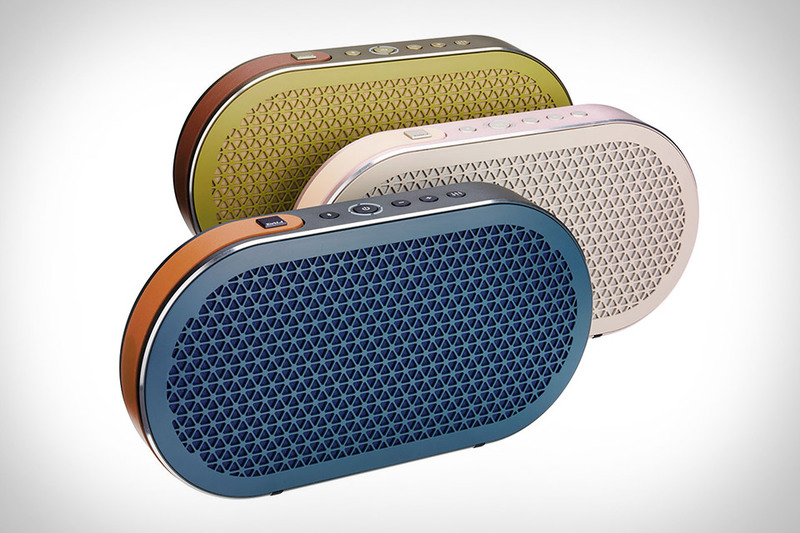 The speaker delivers rich sound from an impressively compact body. The U-Series is statement lighting with a capital 'S'. The result of a brief given by FX Ballery, the founder and head designer of French company Arpel, to Belgian designer Sylvain Willenz, the the U-Series is a new chapter for Arpel, which, until that point, had been focusing solely on table and wall lamps. 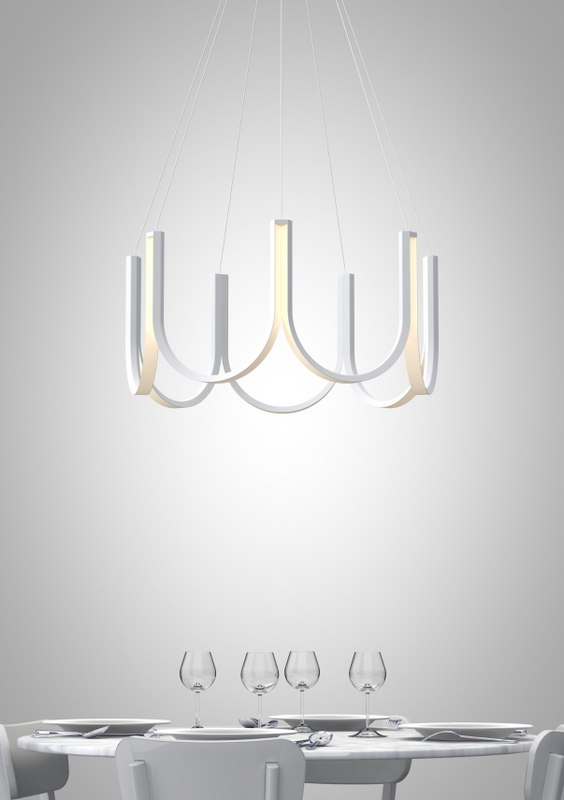 The light has been designed with precision and manufactured from extruded aluminium. It houses LED technology and can either be installed as a single suspension, hung in grouped arrangements or arranged in linear compositions. The U-Series is suitable for residential and commercial settings and the intensity of the light can be adjusted by means of a mobile phone or tablet application. The light is the perfect combination of Willenz's graphic approach to design and Ballery’s aim to develop LED lighting with timeless appeal. It is currently only available in black or white. These metal and porcelain vessels are the result of a collaboration between architect and product designer Natascha Madeiski and silversmith and jewellery designer Linnie Mclarty. Inspired by an archaeological dig in Lebanon, the Now and Then collection comes in four sizes and features a subtle palette of matt colours including an earthy salmon pink, vibrant green and calm grey. Each rounded, lidded container is made from porcelain using a slip-casting method and features a metal accessory (brass spoon, sieve, fork) or handle. 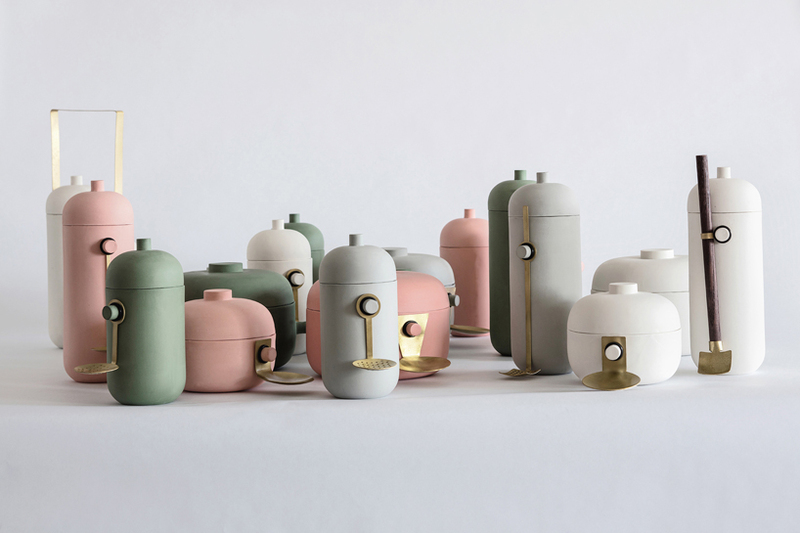 The designers consider the objects to be anthropomorphic in nature, like a platoon of soldiers guarding their contents. 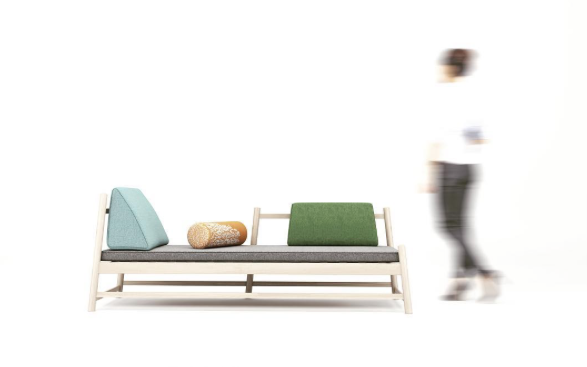 The Pita daybed from Peca studio is a spare, but striking-looking, piece of furniture. Made from turned oak wood, the seat comes with triangular leather cushions that are accented by a hand-embroidered bolster cushion made of maguey fibre yarn from Colotlán, Jalisco, the birthplace of the ancient technique of piteado from which the sofa derives its name. We love a structured handbag and must confess that were weren't thrilled when the bucket bag became the "it" bag a few seasons ago. 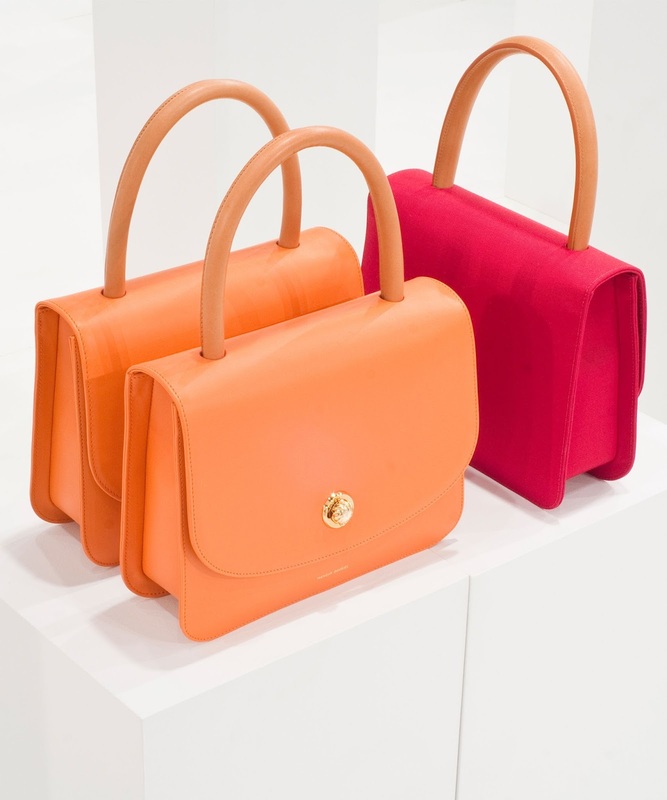 The trend was led by Mansur Gavriel, who have switched gears and return with this richly-coloured collection of nine new bags including the ladylike top-handled ones pictured here. We've had our eye on the water pitcher by Soma which is available from one of the high-end grocers on the island for a while now, so it is no surprise that we were drawn to the Soma glass water bottle, a fairly new addition to that company's collection. Made from high quality, shatter-resistant glass with a protective silicone sleeve, the Soma Bottle is perfectly designed to fit into a bag or cup holder. It is lightweight, durable and comes with a leak-proof bamboo cap that is made from a renewable resource. The best part? For every Soma Bottle purchased, a donation is made to charity to support safe drinking water projects globally. 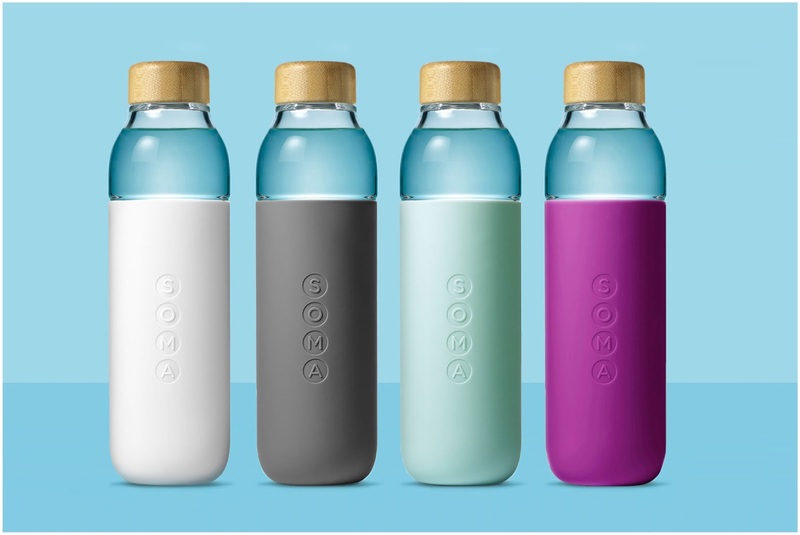 The Soma Bottle comes in white, grey, mint and eggplant. Knitwear designer Aisling Camps got the inspiration for her latest collection from the caves on Gasparee Island, Trinidad which are home to natural limestone formations. She incorporated these elements into her designs: stalactites became fringing, while cables took the form of calcified deposits. Nubby, textured merino was juxtaposed with slick monofilament to mimic wet rock or mossy mohair and everything was rendered in earthy colours. The Bradley Hooper Side Table from Dowel Jones is made of steel rod and spun steel. Designed and manufactured in Australia, the table is part of a series of stools, coffee tables and side tables characterised by their concentric rings and bottle-like shape. 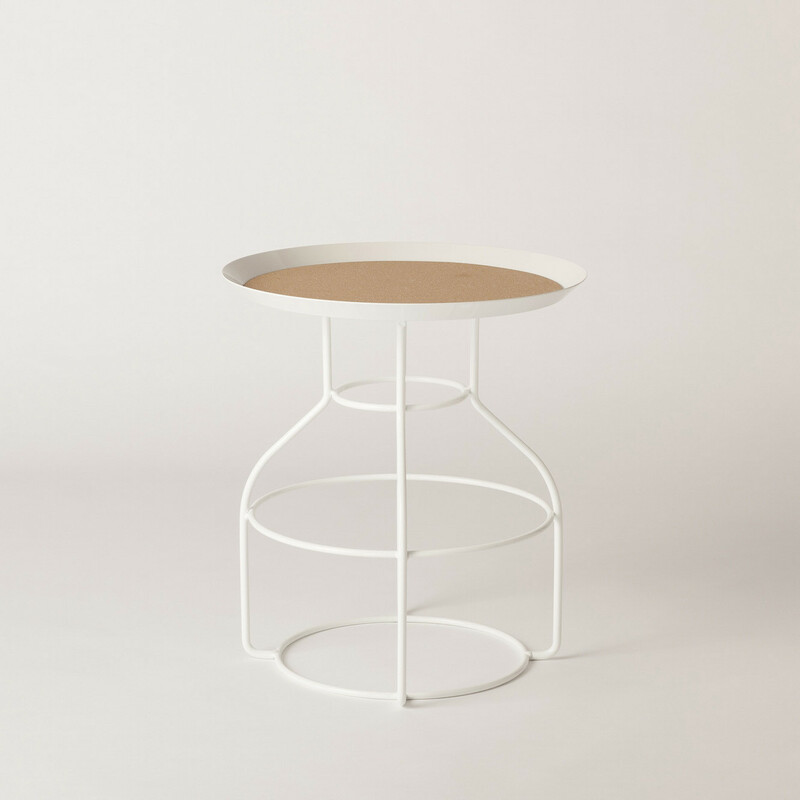 The Bradley Hooper side table features a tray top lined with cork and is available in a wide range of finishes. Art as fashion or fashion as art? That's the question this collection from Russian fashion designer Glagoleva Olya seeks to pose. 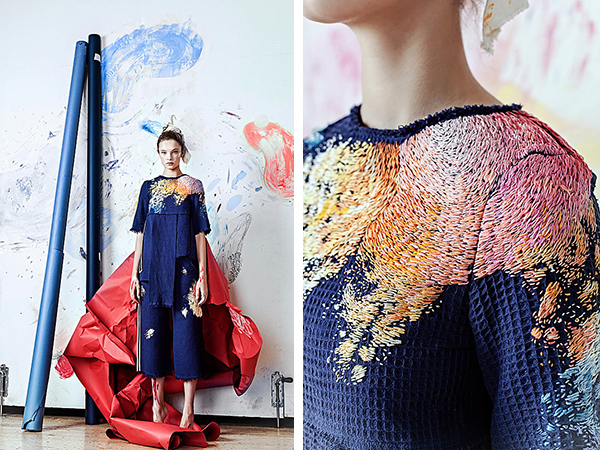 Olya's eco-friendly line Artist At Home tapped Lisa Smirnova, a contemporary artist whose medium is embroidery, to create a line that takes its inspiration from from the workwear of painters. Every item of clothing is unique, decorated as they are with the delicate hachure embroidery that reflects Smirnova’s intricate style and which transforms the garments into distinctive, wearable pieces of art. Olya uses cashmere, organic Indian hemp, cotton and denim as well as vintage towels and blankets in her creations, each of which can take up to 100 hours to create. 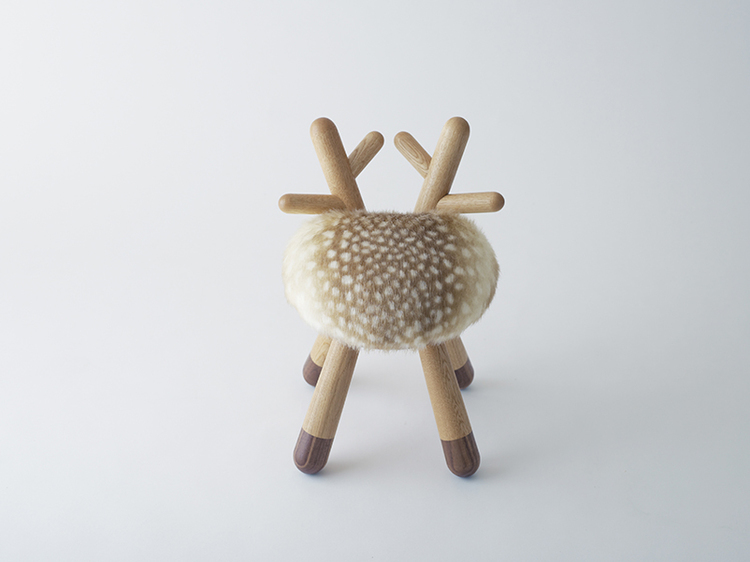 Prepare yourself for cuteness overload with these deer and sheep stools by Japanese design company Kamina&C. Made from European oak and American walnut with nylon seat fabric for durability and ease of maintenance, the horns or antlers double as backrest or can be used as hooks. Simple styles made from outstanding fabrics are the markers of the designs of Sindiso Khumalo, a South African textile designer currently living and working in London. That the Central St Martins graduate studied architecture at the University of Cape Town is evident in the use of linear and geometric patterns in her designs. 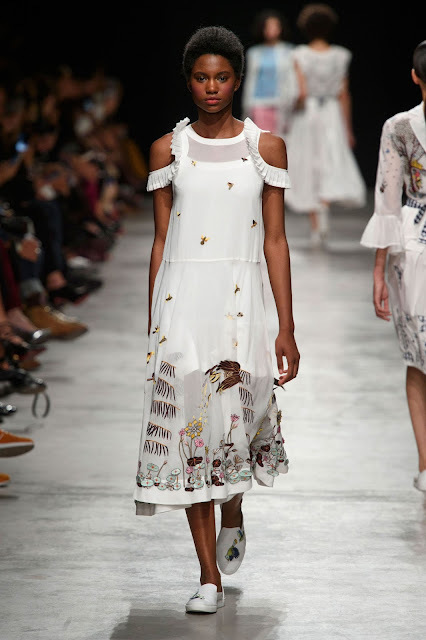 Khumalo founded her eponymous label in 2012 with the intention of creating modern, sustainable textiles and she works closely with non-governmental agencies and workshops around South Africa to develop and manufacture the handmade textiles that are used in her collections. 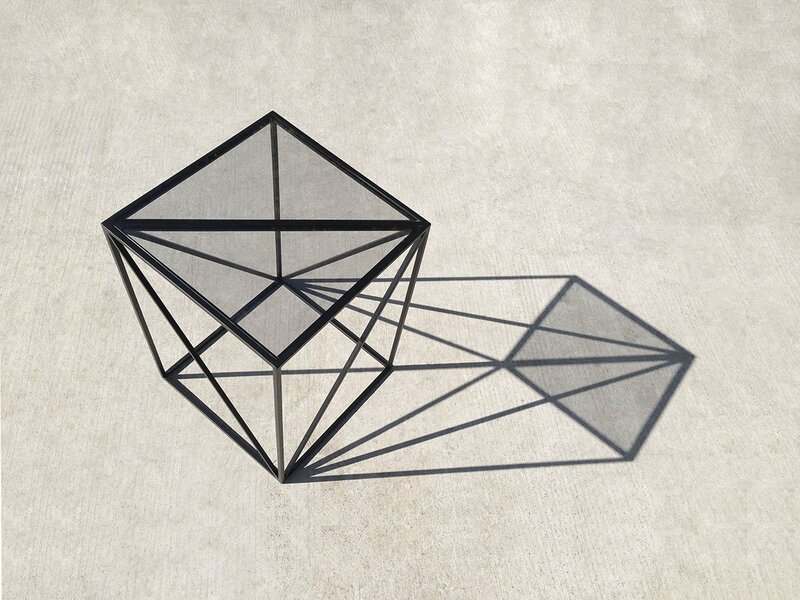 The Gabo G side table by designer Cemal Çobanoğlu creates beautiful three-dimensional, geometric shadows and illusions. Named for the constructivist sculptor Naum Gabo, the table's top is made of tempered glass and rests on iron legs. How does a portrait photographer create an intensely personal series without setting foot in front of the camera? 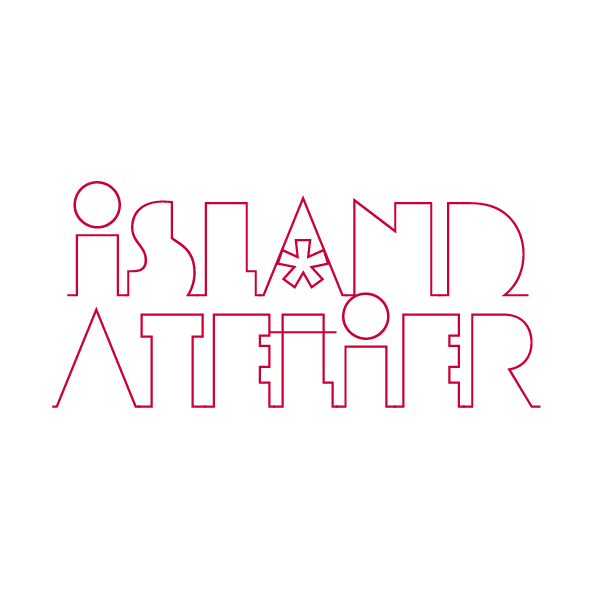 Meredith Andrews uses models as surrogates in 'Island Obscura', a new show that opened at the Masterworks Museum of Bermuda Art at the end of September. In something of a departure from her usual style of portraiture which often features subjects posed formally while looking directly at the camera, this new series sees the models, who are stand-ins for Andrews herself, striking pensive or playful poses with their identities hidden or obscured. Andrews views the series as an expression of her Bermudian experience. The locations were carefully chosen for their importance to Andrews personally, and she has given prominence to the surroundings: lush green vegetation, as abundant but often not given as much due as the blue waters that surround the island, gets a starring role while the models are either supporting characters or literally form part of the backdrop. 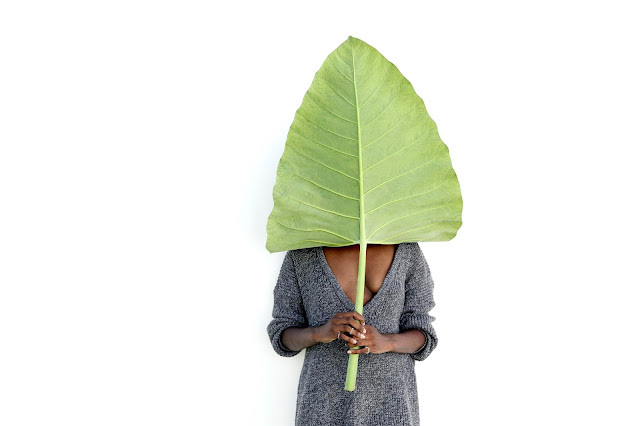 This desire to blend in and go unnoticed is the common and recurring theme, and the models are often overlaid with images of plants or are photographed holding mirrors which are used to reflect the surrounding environment back to the observer and to create a form of camouflage. Adding to the natural feel, the pieces were printed on birch wood and its swirling grain added texture and depth to the images. 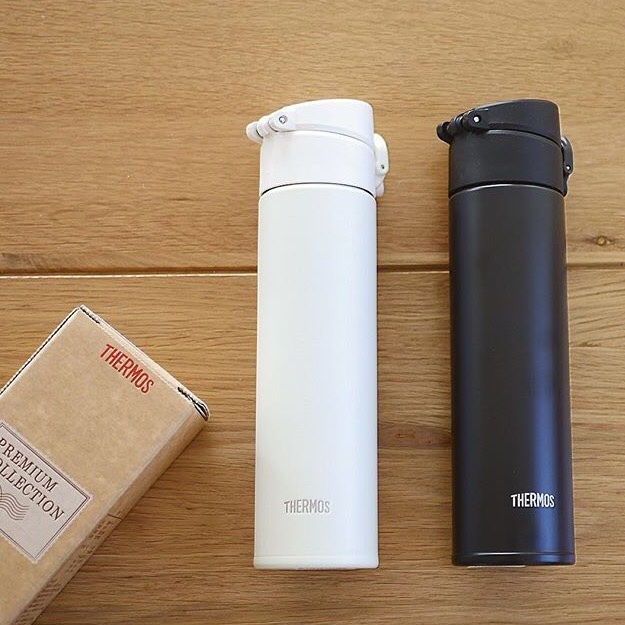 We like the simplicity of the monochromatic versions of these premium collection bottles from Thermos. Available in Japan. 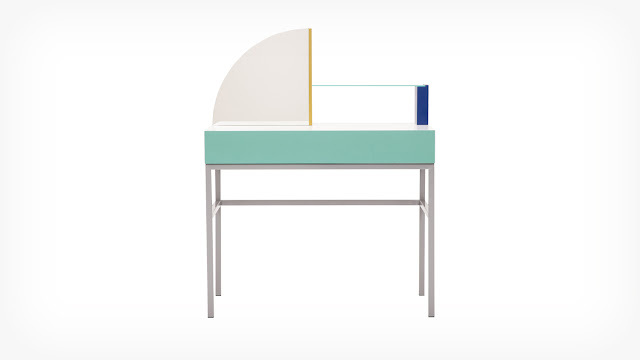 This dressing table by Zoë Mowat Design for EQ3's Assembly collection takes its inspiration from the Art Deco movement and is an exploration of geometric composition. A narrow floating glass shelf offers a surface to display lotions, perfumes or jewellery, while a large drawer keeps the less glamorous items tucked away. A sector-shaped mirror adds a welcome curved line and pops of colour highlight the various elements. 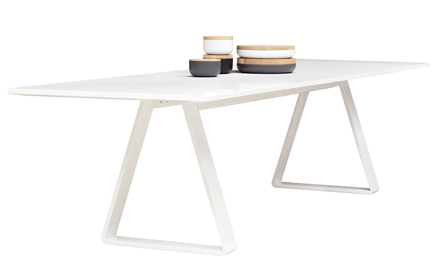 The table is made of MDF with a glass frame on metal legs. 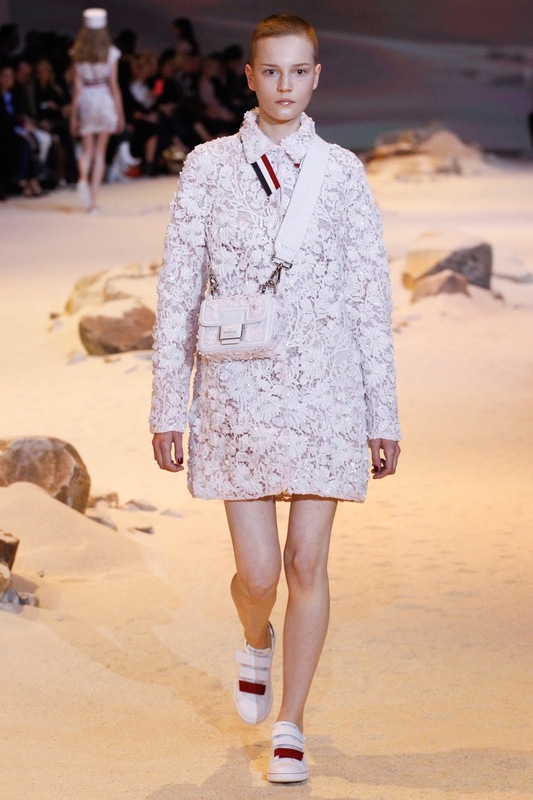 Always one of the last shows and still one of our favourites, at Moncler Gamme Rouge creative director Giambattista Valli looked to the traditional French Gendarmerie uniform as inspiration for a strongly patriotic collection as models navigated piles of sand and rocks perhaps intended to evoke the Sahara. Valli's tribute was as unsubtle as they come: the palette was restricted to the national colours and one jacket mimicked the Tricolour almost literally. Outfits featured embroidered bees, a Napoleonic symbol, and elements of historic ceremonial dress were recurring. Several models wore the kepi, a cap with a flat circular top and visor more commonly sported by the military and capes were deemed to be appropriate outerwear. A print of architectural plans of 18th century Parisian buildings was also used to good effect. Given all of the negative events that have happened in that country recently, the need to create some national pride was understandable, timely and a good way to close the week. Like Thom Browne, Miu Miu featured bathing ladies, but while Browne's muse lounged poolside, here Miuccia Prada looked to the sea for her inspiration. Her colours and patterns were unequivocally mid-century modern in their look and feel and the flower prints and abstract art elicited a certain proper 1950s glamour. Hats were bathing caps adorned with flowers and these proved to be the perfect accompaniment to modest coat dresses and swimwear. Almost every look was belted or had some feature to draw the eye to the midsection. Accessories, such as the oversized, geometric sunglasses, were on point. The bags were standouts as were the shoes. Ranging from platforms to slides, several of the thick-soled sandals were made of a translucent material and the stacked platform made it appear as though the models were walking on waves. Seaside motifs could be found throughout the collection. It's been an irregular month of shows and Paris (which closes today) was the perfect example. There have been several high-profile events including Chanel and Alexander McQueen, but not many of the collections as a whole grabbed our attention. 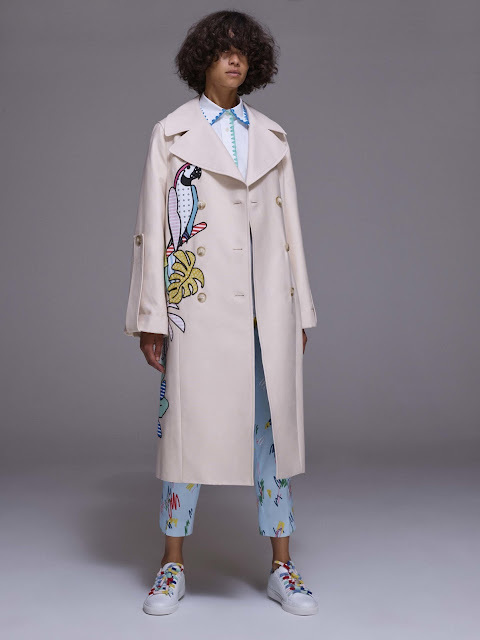 So, to bid farewell to the city, we thought we'd start by featuring this collection from Mira Mikati which saw the tropics reinterpreted in a fun and lighthearted way. We loved the cut-out treatment of the toucans on skirts and trousers and, of course, the star pattern. The clothes were playful but not juvenile and featured embroidered chimpanzees and inspirational quotes. The result was an easy, comfortable and relaxed but still stylish collection. Rahul Mishra chose the rainforest (as seen through the eyes of painter Henri Rousseau) as his inspiration. The exotic space was translated as red, black and blue gingham check, frills and layers. Shoulders took the spotlight and we loved the delicate embellishments and embroidery on bomber jackets, blouses and tops that highlighted this area. Sheer shirts were half-shrugged off shoulders and cut-outs were accented by frills and pleats. A pretty and whimsical collection. Time to compare and contrast. With the departure of Maria Grazia Chiuri to Dior, this collection marked the first solo offering of her former co-creator Pierpaolo Piccioli at Valentino. Piccioli took his inspiration directly from iconic designer Zandra Rhodes, however as with Dior, we saw etherial and heavily embroidered dresses and gowns. His colours and materials felt richer and included pleated velvet and lace in pinks and reds, black and chartreuse. Piccolo accessorised his clothes with miniature bags and bold earrings in the form of daggers. 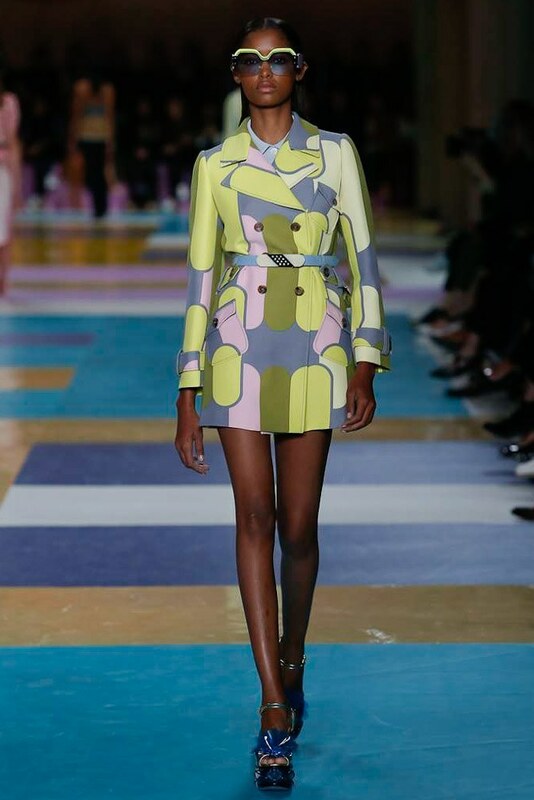 We're going to post our reviews of Dior and Valentino back-to-back so you can draw your own conclusions regarding the similarity (or not) of the aesthetic of the two Houses. Maria Grazia Chiuri put on her first show for the House of Dior since leaving Valentino, and the sport of fencing was an obvious, if unusual, reference. The first few looks featured breastplate designs and jackets that were immediately recognisable as having been derived from the uniform of the sport. This was a the muted collection and no bright colours were shown. Unlined, sheer skirts layered over modesty shorts and obvious corsetry and boning were two staples used throughout. The light and airy skirts were often paired with more substantial sweaters and knitwear as a counterpoint. Conspicuous branding appears to be making a comeback in Paris with several designers prominently displaying their name on clothes. At Dior, this was done by the means of athletic tape that was used to border straps, hems and even shoes and served as a direct reference back to the sport of fencing which Grazia Chiuri chose as a starting point. Our favourite looks included the tarot-card-inspired evening gowns with their tulle skirts. These dresses were covered in symbols of the dark arts and witchcraft, astrological signs and four-leaf clovers. In this time of change for the House of Dior, perhaps Grazia Chiuri was looking to the heavens for guidance. 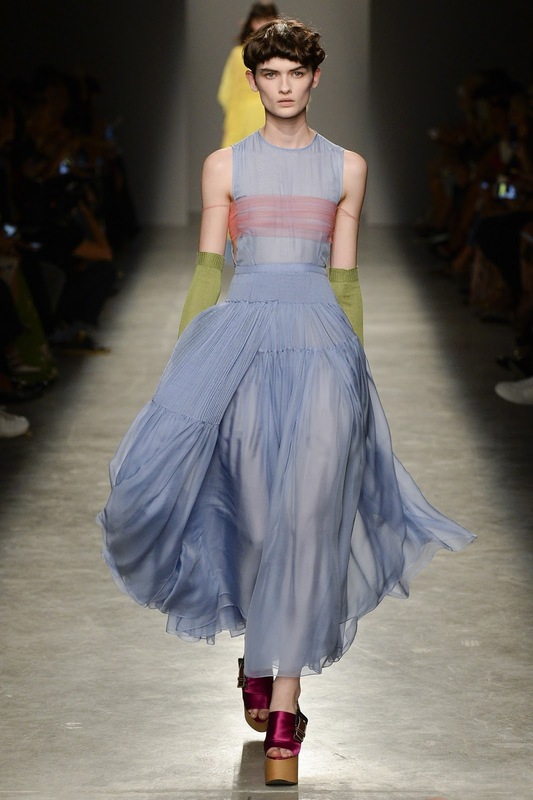 For Rochas, Alessandro Dell’Acqua relied on 1940s silhouettes and airy, voluminous skirts to set the mood for Spring. In colours that were inspired by artist Erwin Blumenfeld, he toyed with a form of colour-blocking mixing marigold, periwinkle, blush pink and lilac. Pleated gowns were paired with crew-necked sweaters and everything was accessorised with elbow-length gloves in contrasting hues.